I am trying my best to use up the pack of dried lavender given to me by my cyberfriend vb, before it expires in a couple of months' time. 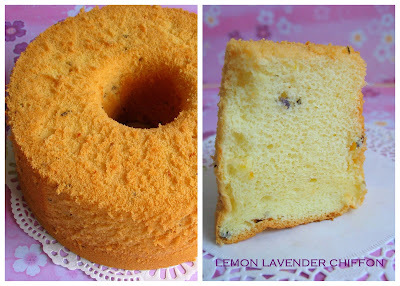 I tried baking a lavender pound cake two weeks ago, but it didn't turn out well. The pound cake was a little dry...I suspect I have over baked it, so I won't be posting that recipe until I give it another attempt. 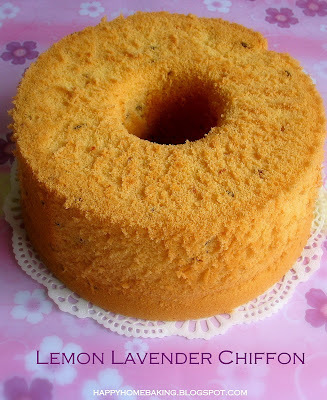 Here's another lavender cake I baked a few days ago, this time it's a lemon lavender chiffon cake. I love taking pictures of a plain, whole chiffon cake...to me, it is the most photogenic 'model' I have 'worked with'. It looks good even without any frosting or decoration. Somehow, which ever angle I take, the images mostly turn out great. I like how gorgeous the golden crust looks from my view finder...and the hole in the centre, it creates a lot of 'depth' to it...a plain cake without the hole won't look as interesting. The cake was very very tender and soft. It was so delicate that I sub-consciously handled it with extra gentleness when slicing it. The texture is not as firm or 'springy' compared with the Earl Grey Chiffon cake I made previously. I much prefer that one, although this lavender version was pretty moist. I hope to try another flavour...green tea with red beans soon. 1. I have a driving license but I don't drive, or rather I CAN'T drive! 2. I write better in English but speak better Mandarin. Sometimes I will think in English but verbalise my thoughts in Mandarin, at other times I will think in Mandarin and write in English...isn't that confusing?! 3. I baked my first batch of brownies 8 years ago with a box of Pillsbury premix. 5. I love to visit the Ikea store, I never leave the place without buying something. 7. Besides baking, I like to grow plants, although most of the time I ended up killing them. Currently, I have one young chili plant which I have grown from seeds, one sprig of rosemary grown from cuttings I brought all the way from the states, two lime seedlings, three pots of money plants, one aloe vera and two new pots of african violets. Link to my blog (tagger) on your blog. Give seven facts about yourself. Tag another seven bloggers by leaving a comment on their blogs and letting them know they were tagged and listing them (and their blogs) on your blog. Sieve flour, baking powder together, set aside. Drizzle in the water, whisking at the same time till the mixture is well combined. Repeat the same with the oil. Add in the lemon zest, mix well. Sieve over the flour mixture and whisk until flour mixture is fully incorporated into the batter. In a clean, dry mixing bowl, beat egg whites with an electric mixer until mixture becomes frothy and foamy. Gradually beat in the sugar and beat on high speed until just before stiff peaks form* (after note: after several attempts at baking chiffon cakes, I learned that the whites should be beaten until just before stiff peaks form). Add the beaten egg white into the egg yolk batter in 3 separate additions, each time folding gently with a spatula until just blended. Fold in the dried lavender. Pour batter into a 18cm (7 inch) tube pan (do not grease the pan). Tap the pan lightly on a table top to get rid of any trapped air bubbles in the batter. Bake in pre-heated oven at 170 degC for 35 ~ 40mins or until the cake surface turns golden brown, and a skewer inserted into the centre comes out clean. Remove from the oven and invert the pan immediately. Let cool completely before unmould. To remove the cake from the pan, run a thin-bladed knife around the inside of the pan and the center core. Release the cake and run the knife along the base of the pan to remove the cake. Dust with icing sugar if desired. What a gorgeous looking chiffon cake. I have tried and failed for the umpteen times trying to bake mine. Mine always crack on top and they never ever have a crust when I unmold. Thank god taste wise and texture quite alrite, and we usually finish the cake very quickly cos it's such an easy cake to eat. I'm not giving up, hope to bake beautiful ones like yours someday. You've got a wonderful chiffon cake! You baked it very well. 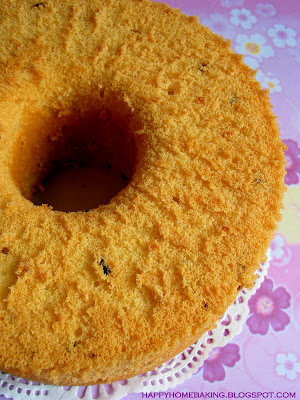 I found that those moisture chiffon cake keep very well in the fridge and it's quite refreshing. 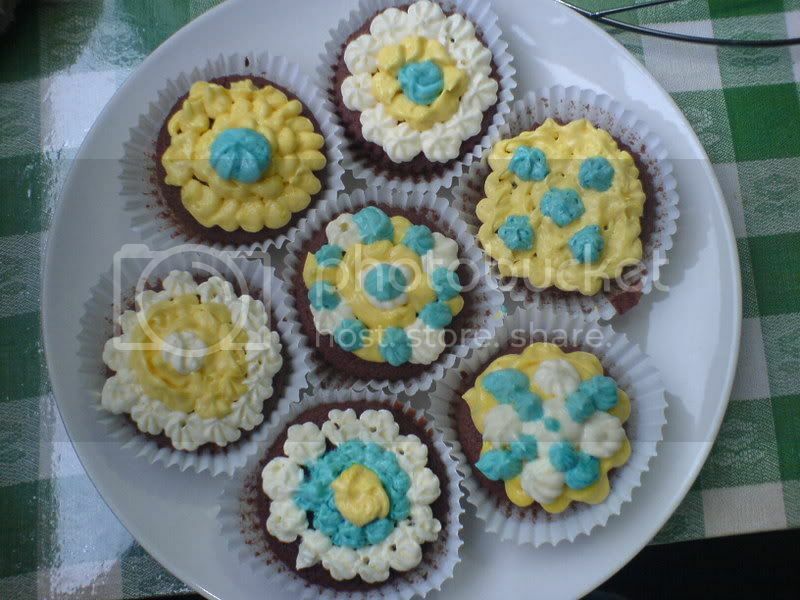 Its moisture also suitable to make simple deco with fresh cream as a celebration cake. Anyway, this chiffon looks gorgeous without any deco. I really like your baking! Hey, thanks for tagging me at your blog. I feel happy to have someone sharing their baking with me. Cheers! hey, we have a few things in common. I also have a license but can't/dont drive. i also speak better in Chinese but write better in english. and i love to visit Ikea as well! The look of this is gorgeous and the flavors sound amazing! 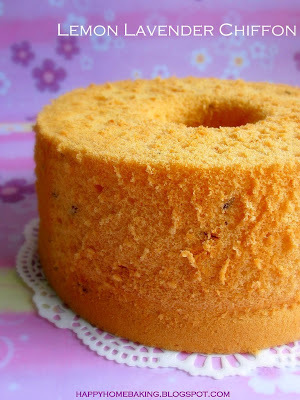 Your Chiffon cake looks wonderful! Great picture. We bake our chiffon cakes in mini forms so that they can be enjoyed as individual treats eliminating the need to be sliced. This is great for kids. They can easily serve themselves this way. Check out our website www.baker-babes.com to see a picture of our chiffon cakes. Your chiffon always looks so perfect! And it is because it is so perfect that 's why you can take nice picture of it. :) I love this purple background of yours. Your cake looks wonderful as usual, nice touch there with the "background" really lovely. Your chiffon is sooo soft & fluffy ..I shall not try it now as I am still not confident doing it in my small table top oven. Waiting to shop for a built-in! Secondly, your bakes are always so pretty and lovely. Thirdly, thanks for sharing your recipe. You're such a generous person. Hi ek, I'm sure you are just one small step away from the perfect chiffon cake. My chiffon will usually crack a little, but after sinking like the Titanic, the crack would always close up! Hi Grace, I have not tried chilling chiffon cakes, I always leave it in room temperature. Will try it the next time! Hi Aimei, like you I got my driving license based on a manual-gear car...but I doubt I can drive an auto car! Hi Family First, I am also using a tabe top oven...the biggest tray it can fit in is not more than 14"! Jane, my cyberfriend sent me the dried lavenders from Hong Kong. I have not bought any here although I have seen it a Phoon Huat...the outlet at Hougang. You may want to call and check whether they still carries it, you can also check with Sun Lik? Hi HHB, I have tagged you on my blog, cheers! May I know, for steps 3 and 4, can I use the electric beater instead of using hands? I don't think I can last that long. What a gorgeous and tall chiffon cake! By the way, I find that everytime I used his recipe, the egg yolk batter was very thick. I need to add a bit more liquid to make it smoother. Is it bcos of the eggs I used. The eggs I used were usually small to medium. Does it have to be large eggs? 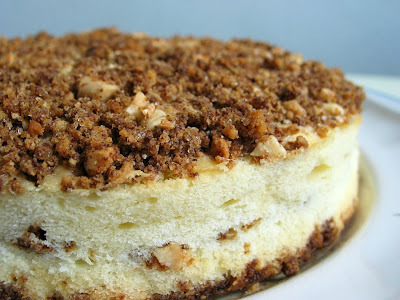 I usually follow chiffon cake recipes exactly, and I also use medium-sized eggs. I suspect it could be the beating/folding in of the egg whites. Do you know which step you didn't do right this time? Hmmm, This time round, I think I slightly reduced the time in beating of the egg whites. I tried to beat until stiff and glossy, with a curved tip when the beater was raised, but not stiff straight. Do you think this is correct? I really dunno how stiff it should be. I guess could be the folding, cos I think i tend to have the habit of "fold/beat a little more' just to be save. Hehe... How did you fold the egg white and how fast? Haha...Okie...I will take note in the folding of the egg whites properly. Thanks! This is the first time I read your blog. You are funny !!! Keep on baking, so we can share your baking ideas. We do have a lot in commons. It's quite cold now in Canada, and I am glad to find your web site. which is very helpful!! I made this with a BIG hiccup, forgot to add flour! Was kena distracted when DD1 offered to help mix the yolk mixture and I proceeded to whisk the egg whites. After pouring 1/3 white batter in the yolk, I was still thinking why is the mixture so watery?? It was only when the pan is baking in the oven did I realise that my flour is still sitting on the countertop! Hi Blessed Homemaker, oh dear what a hiccup! But you are not alone, I once made a batch of muffins and I forgot to add in the eggs ;p Will you try it again? I tried this out today, wanted to practice my whisking of egg white and egg yolk mixture and folding in, you see! Anyway, I've taste tested it, and it's yummy! Only problem is that I didn't have a tube pan of the right size. (Mine's the huge one for making the traditional pandan cake ;( ) Anyway I went ahead to use it so it certainly "falls short"... but tastes lovely! But it isn't quite as delicate as you mention, it's got the softness of the usual pandan cake from outside... I hope it's alright! Anyway, thanks for sharing! Will put an 18 cm tube pan on my shopping list, and try this out again. Hi Florence, maybe it is the size of the tube pan, so the cake is not as delicate or tender? Hi! I live in Swiss and I miss Pandan cake so much but the mould is not availbale here so I replaced with silicon Gugelhupf mould. It worked PERFECTLY!